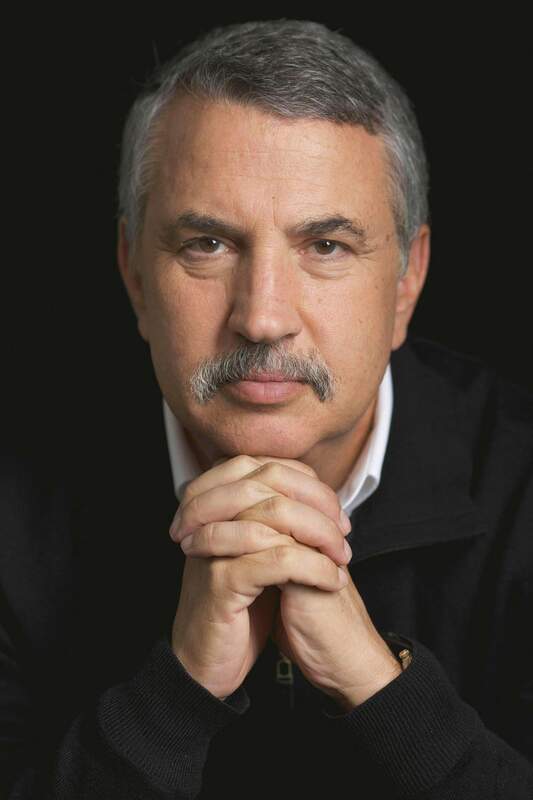 Thomas L. Friedman, a two-time Pulitzer Prize winner for The New York Times. If your puppy makes a mess on your carpet and you shout “Bad dog,” there is a good chance that puppy’s ears will droop, his head will bow and he may even whimper. In other words, even a puppy acts ashamed when caught misbehaving. That is not true of Donald Trump. Day in and day out, he proves to us that he has no shame. We’ve never had a president with no shame, and it’s become a huge source of power for him and trouble for us. And what makes Trump even more powerful and problematic is that this president with no shame is combined with a party with no spine and a major network with no integrity – save for a few real journalists at Fox News like the outstanding Chris Wallace. First, there is no one inside his party or base who is going to sustainably stop Trump from being himself and doing whatever he bloody pleases. The Republican Party has completely lost its way. Don’t be fooled by the last-second tut-tutting of GOP senators about Trump’s kowtowing to Vladimir Putin in Helsinki and spurning of our intelligence agencies. Until and unless the GOP-led Congress passes legislation that protects special counsel Robert Mueller from being fired by Trump or enacts into law specific, deeper sanctions on Russia if it is ever again caught trying to tilt our elections – or secures Trump’s tax returns or the transcript of his two hours and 10 minutes of private conversation with Putin – it’s all just talk to cover the GOP’s behind. Let Republicans in Congress do something hard and concrete that shows they love our country more than they fear Trump’s base and I’ll believe their words. The fact that Trump’s party and his network always look for ways to excuse him has been hugely liberating for Trump. He can actually deny he said things that were recorded, like his trashing of the British prime minister. He can take one side of any issue (like trashing key NATO allies to satisfy his base) and, when he gets blowback, take the other side (claim to love the Atlantic alliance). And he can declare that he really meant to ask why “wouldn’t” Russia be the one hacking us instead of why “would” it, as he did say. If you believe that last one, I have a bridge near the Kremlin I’d love to sell you. “Hey, give him a break,” say Trump’s supporters, “there is a method to his madness.” And that is true. What they don’t admit, though, is that there is tremendous madness to Trump’s method. And then, there is just his sheer madness, ideas he holds that are ignorant gut impulses with no relation to science, math or history. For starters, you’d sign the Trans-Pacific Partnership, creating a free-trade alliance around American values, standards and interests, with 11 other Pacific economies, creating a trade agreement covering 40 percent of global GDP. Then you’d forgo ridiculous steel and aluminum tariffs on our European Union allies and sign them all up instead to join us in our efforts to curb China’s trade abuses, which the EU suffers from just as much as we do. Now that would get the attention of China, not a foolish trade war based on bilateral trade deficits. But what did Trump do with his method? Blow up TPP, blow up relations with the EU and confront China alone, an utterly mad method that I do not believe will produce the meaningful, sustainable trade realignment with China that we need. And then there is the sheer madness. Threatening the UK that if it doesn’t do a full Brexit it will not get preferential trade treatment from Trump, calling the bloc a “foe” on trade, and sneering at the number of refugees it has admitted. Where do you start? The EU is the United States of Europe, the other great center in the world of free markets, free people, liberty and democracy. It has kept the peace in Europe after a century of strife there – that dragged us into two world wars – and its economic growth as a trading partner has made both America and the EU steadily richer and more stable. It is sheer madness to believe that it is in U.S. interests to see the European Union fracture! The only way to change this situation is not by hoping the president develops some shame or that this version of the GOP develops some spine. It is by Democrats winning the House, the Senate or both in the midterm elections. Only by dealing an electoral defeat to this version of the GOP in the midterms will we possibly get a healthy conservative party again (which we need) and curb Trump’s power. Everything else is just words, and words without power change nothing.